The flexibility of the VBA buttons argument makes it easy to customize your Excel message boxes. You can choose which buttons to display, determine whether an icon appears, and decide which button is the default (the default button is “clicked” if the user presses Enter). You can use built-in constants for the buttons argument. If you prefer, you can use the value rather than a constant (but using the built-in constants is a lot easier). Or, if you prefer to make your code less understandable, use a value of 52 (that is, 4 + 48). Check out the message box Excel displays when you execute the GetAnswer3 procedure. If the user clicks the Yes button, the routine executes the procedure named RunReport. If the user clicks the No button (or presses Enter), the routine ends with no action. Because the title argument was omitted in the MsgBox function, Excel uses the default title, Microsoft Excel. The MsgBox function’s buttons argument determines what appears in the message box. This example demonstrates an efficient way to specify a longer message in a message box. A variable (Msg) and the concatenation operator (&) are used to build the message in a series of statements. The vbNewLine constant inserts a line-break character that starts a new line (use it twice to insert a blank line). The title argument is used to display a different title in the message box. 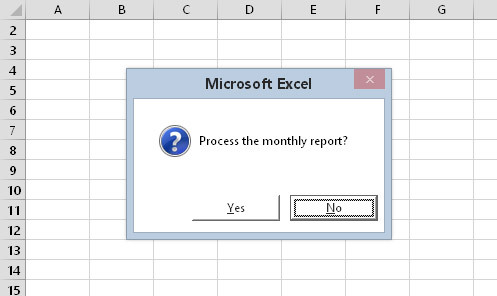 Here is the message box Excel displays when you execute this procedure. This dialog box, displayed by the MsgBox function, displays a title, an icon, and two buttons. You can use constants (such as vbYes and vbNo) for the return value of a MsgBox function. Here are a few other constants. vbOK 1 User clicked OK.
vbCancel 2 User clicked Cancel. vbAbort 3 User clicked Abort. vbRetry 4 User clicked Retry. vbIgnore 5 User clicked Ignore. vbYes 6 User clicked Yes. vbNo 7 User clicked No. And that’s pretty much all you need to know about the MsgBox function. Use message boxes with caution, though. There’s usually no reason to display message boxes that serve no purpose. For example, people tend to get annoyed when they see a message box every day that reads Good morning. Thanks for loading the Budget Projection workbook.